On Friday, November 30th, I attended an annual party which culminated in the group going to the Flynn Theater for the latest Warren Miller film. It was a sell-out that night! Another example of the pent-up excitement and anticipation that precede the ski season. Ski movies have always been a popular way for skiers to get psyched for the season. It all started in the 1920’s. Dr. Arnold Fanck, a German film maker, made what is generally recognized as the first ski movie in 1921. 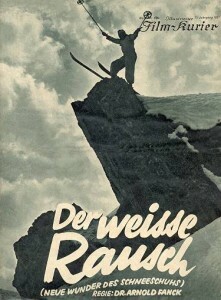 The English title was “The Wonder of the Skis” and it helped introduce the relatively new sport of alpine skiing to European audiences. Jumping back to today, Warren Miller is definitely the most recognized name in ski movies. However Warren has nothing to do with today’s Warren Miller films! He sold the company that bears his name and since 2004 has not been involved in any way. Some of us miss his wry humor and the trademark “If you don’t do it this year, you’ll be another year older when you do!” that ended his films. In 1946 at age 22 Miller got out of the Navy after World War II. He became a ski bum at Sun Valley, Idaho, and also began shooting movies on a simple 8mm camera. By 1950 he had graduated to a more professional 16mm camera and released his first feature-length ski movie called “Deep and Light”. From then until 2004, Warren Miller released a film every year. Initially Miller traveled around showing and narrating his films in person. As the movies became more successful, his narration would become part of the sound track. In 1947 at Sun Valley Warren Miller attended a ski film presentation by John Jay. John Jay was the great-great-great grandson of George Washington’s first Secretary of State also named John Jay. In 1934 John Jay – the younger one, that is – entered Williams College and quickly joined the skiing community. This included trips to Woodstock, Vermont to take advantage of the first rope tow in the United States. Jay’s family became concerned with their son’s preoccupation with skiing, so Jay borrowed the family 16mm movie camera. His idea was to share the fun of skiing with his family and alleviate their concern. He found that friends and family alike enjoyed his witty narrations. He also found that presenting these movies around New England ski towns could get him free room and board! After graduating from Williams, John Jay looked for ways to stay involved in skiing. 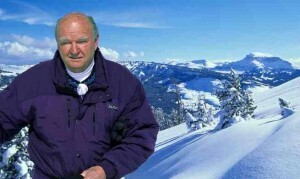 He talked the Canadian Pacific Railroad into hiring him to do a film promoting powder skiing in the Canadian Rockies. 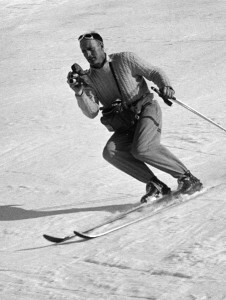 The result was his first ski film called “Skis Over Skoki”, the first American film of its kind following the model of Dr. Fanck. In World War II John Jay served in the 10th Mountain Division. But he served as a film maker! His films were used for training and documenting the 10th Mountain Division for recruiting purposes. His second film, “Ski Patrol”, was produced in 1943 as a recruiting tool. 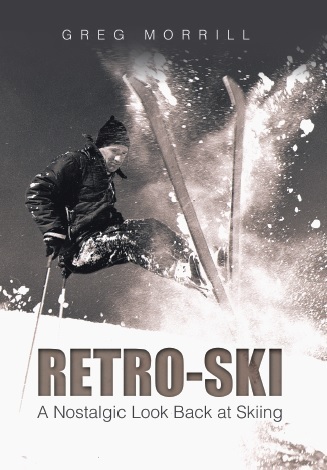 Following the war John Jay would produce a ski “lecture” film each year from 1945 until 1970. He would log countless miles showing and personally narrating these films hence the term “lecture”. As mentioned he definitely influenced Warren Miller who would carry on the style Fanck started and Jay continued. Interestingly one of the early influences on John Jay was Victor Coty, Stowe’s own ski movie maker! Coty began filming at the 1932 Olympics held at Lake Placid. He put together films that he would show at sports clubs and personally narrate, usually with a lot of humor. Coty moved to Stowe in 1942 where his self-narrated movies became a regular feature in the Akeley auditorium. For more on Victor Coty and his family check out Amanda Kuhnert’s article in the current Winter/Spring issue of the Stowe Guide and Magazine.